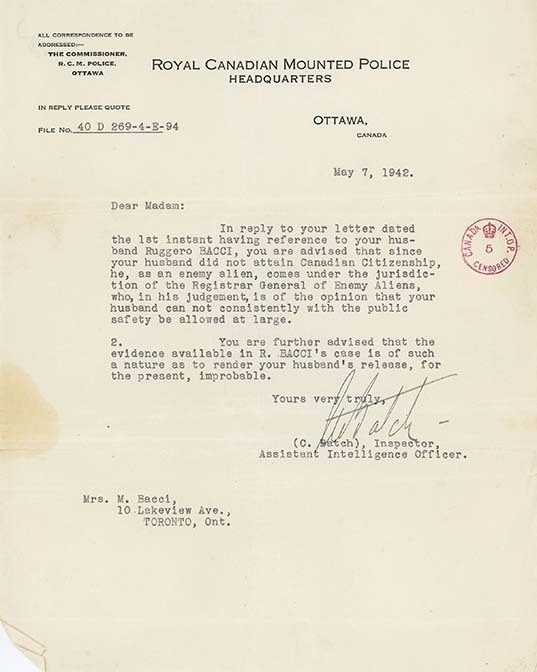 Letter from C. Batch (RCMP Inspector for Registrar General of Enemy Aliens), to Mrs. M. Bacci, May 7, 1942. In this letter, the R.C.M.P. Inspector writes to the wife of internee Ruggero Bacci. The inspector notes that as an Italian national, Bacci comes under the jurisdiction of the Registrar General of Enemy Aliens, who considers Bacci a threat to public safety. He further advises that given the evidene in Bacci's case, his release is "improbable". Bacci was interned for almost three years. According to family, Bacci's wife Erminia (Minnie) suffered a serious nervous breakdown and was hospitalized at length. His oldest son Aldo was forced to quit high school to help support the family. When his father was released and returned home, Aldo received notice that he was conscripted into the Canadian Army; however, he did not serve overseas.